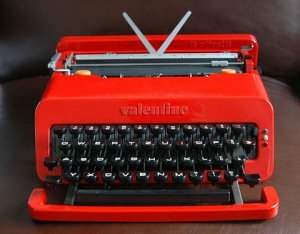 Typewriter that is – The legendary Italian designer Ettore Sottsass first introduced the Olivetti Valentine typewriter in 1969. He wanted to make a portable typewriter for “people on the move”. Fast forward 43 years and the design aesthetic of vintage Italian still survives the passing of time. 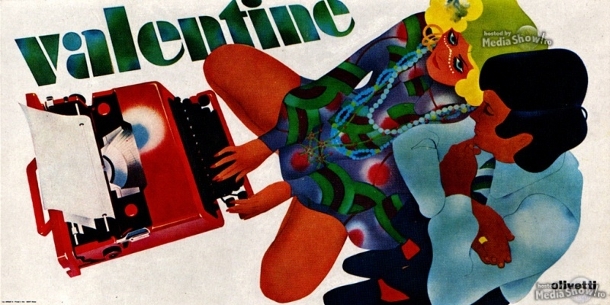 Now featured in the Museum of Modern Art, the iconic design of this Valentine in form and function got people to think outside of the box. And the color! Can I get my hands on one for Valentine’s Day? Are You Part of the New American Cafe’ Society? Are you part of the new American café’ society? Author, journalist and gourmand Lucius Beebe coined the term “café society,” in the New York Herald Tribune in the 1920’s referring to a social group that frequents fashionable spots, such as nightclubs and cafés. Although originally used to refer to the glitterati of the 20’s and 30’s, coffee quickly became a social lubricant for the café society of the hipsters and beatniks of the 50’s and folk-singers of the 60’s. Today a new American café’ society can be found at Starbucks, Peets and countless urban coffee shops and espresso bars across the country where wi-fied connected eyes rise now and again from behind laptops, tablets and smart phones. Let’s hope that technology doesn’t replace social interaction and that the world’s most popular beverage continues to fuel the emotion, imagination and creativity historically associated with café culture to remain an important social gathering point where people come to talk, write, read, entertain one another or pass the time with a good cup of coffee. 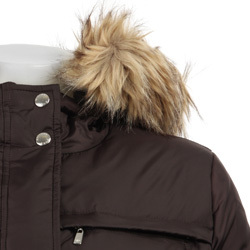 The Danish design company Eva Solo has given new meaning to the phrase “all zipped up”. A saying that either refers to one who is wound pretty tight or a task that has been organized, accomplished or taken care of. Either meaning goes well with their functionally designed Cafe Solo coffee maker. 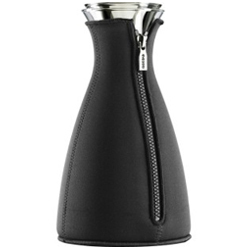 Similar to a French press, the glass flask enclosed in a zipped up neoprene sleeve looks as fashionable as a runway collection or a Michael Kors laptop cover. Keeping wound up coffee-lovers freshly brewed in just 4 minutes. Coffee never looked so good and it’s not even Italian. The Tropic of Cancer, latitude approximately 23°27′ N of the terrestrial Equator, is commonly held to be the incubator for the perfect cup of coffee. It’s here that coffee berries ripen into coffee beans. 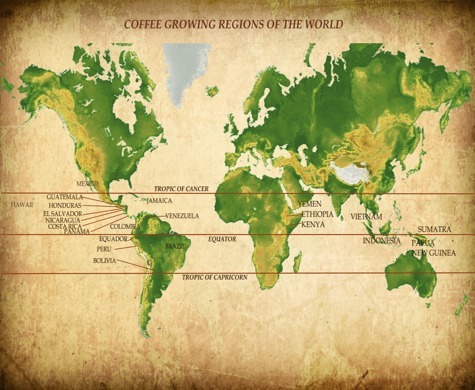 Between the Tropic of Cancer and the Tropic of Capricorn, Coffea Arabica and Coffea Canephora (known as Robusta) thrive at altitudes ranging from about 650 to 6,500 feet to mature and be selectively picked and processed for shipping. There’s something both satisfying and alluring in knowing that the depth and aroma of your morning espresso began in the dark mysterious tropics in a region that receives a higher dose of the Sun’s energy than anywhere else on the planet. It’s no wonder that coffee is considered to be a drink of well –being in Italy and the inspirational muse of musicians, writers, artists and just about everybody else in the world. 100 Most Often Mispronounced Words List Includes ____________? Author Charles Harrington Elster writes in The Big Book of Beastly Mispronunciations – The Complete Opinionated Guide for the Careful Speaker, that there are two types of people when it comes to mispronunciations – those who don’t give the subject a second thought and those who do. This post is for those who do and happen to like espresso. The website Your Dictionary has posted a list of the 100 Most Mispronounced Words and Phrases in the English language and the word espresso is one of them. Don’t say: expresso | Do say: espresso. It seems many of us have a penchant for replacing es- with ex- like in another commonly mispronounced word, especially. Don’t say: expecially | Do say: especially. Food mispronunciations are among the most common. 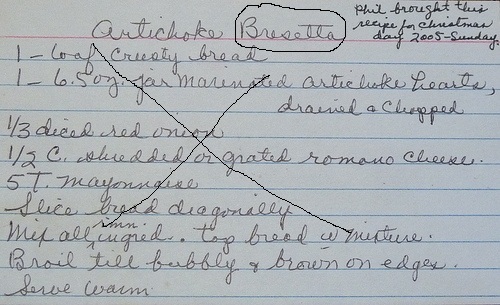 My personal pronunciation rant is the saying of the word bruschetta. The correct pronunciation is (broo-SKEH-tah) NOT (broo-SHEH-tah). No waiter outside of Italy seems to know how to pronounce this word and bastardized recipes for this simple yet profound antipasto are rampant . Regional dialects and fast talking (or in my case fast keyboarding) may account for many mispronunciations which in turn leads to a whole series of spelling issues. Ok is the teacher side in me showing. I’ll stop before I tell you how many times the mispronunciation of the word gnocchi reoccur or is that recur. The purpose behind the blog ITALY IN 30 SECONDS is to offer a written shot of espresso to inform, excite and encourage you to experience Italy, the most recognizable geographic shape on the globe and what we think is the most perfectly constructed place on the planet. Combine that with one of the most perfectly constructed foods on the planet, chocolate, and you’ve got a the makings of a magical mystery tour through Tuscany’s Chocolate Valley, the geletarie of Milan and the chocolate factories of Turin and Perugia. So little time so much chocolate and a business class seat on Alitalia nowhere in sight. Warm up this winter with a melted Italian chocolate fondue or molten chocolate cake made with Cuor di Cacao Chocolate Hazelnut Cream from the “heart of the chocolate” by Venchi, a name known throughout Italy for exceptional chocolate. This extra dark Cuor di Cacao combines the intense flavors of 75% Ecuadorian chocolate with hazelnuts to make a gianduja, a rich creamy hazelnut spread that is beloved by all Italians. Think Nutella all grown up. The small size is perfect for a 30 second chocolate break or a portable pocket picnic at the ski chalet. The color espresso has been described as a rich dark brown, a chocolately hue, favored by everyone from furniture designers to fashion icons. Michael Kors was so taken up with it that he added espresso to his color palette for everything from down filled hooded coats and gloves to watches and the “Hedi” Satchel. The color espresso seems to add a depth and richness to any design and a chic modern look. Although when asked what color IS espresso most people seem to fumble describing it as extra dark mahogany or darkest brown almost black. Neither of which describes Kors’s espresso collection. Color experts assert that colors like espresso, java and merlot are not distinct colors only someone’s idea of what the color should be. It’s all about conjuring up an image, a suggestion of an experience. I googled color swatches and got than 20+ different color matches under my search for espresso proving that it’s all in the eye, or in this case the cup, of the beholder.